Salty Disciples | Lot's wife & disciples of Yeshua? The people of Sodom were prideful and had an excess of everything, yet refused to share with those who genuinely needed it. Their self-focus led to the sins that ultimately caused their destruction. As we know, Lot and his family were right in the middle of this wickedness, and the LORD sent angels to deliver Lot and his family from the region of Sodom before it was destroyed. The Scriptures tell us that when Lot and his wife were visited by the two angels they made a feast for them (Genesis 19:3). The midrash (Bereishit Rabbah 50:4), however, gives us details of the event most people don’t know. It explains that although Lot practiced the hospitality of Abraham, his wife was a native of the region and loathed hospitality. During the meal with the angels, a quarrel broke out between Lot and his wife over salt. Lot asked that salt be given to the angels with their meal, but his wife thought this was pure wickedness. She refused to show her guests this act of hospitality. Let’s discuss salt for a moment. What would life be like without salt? I know a few people who like bland food, but for the vast majority of people life would barely be tolerable if we couldn’t enjoy our food with a healthy dose of salt. Salt is part of daily life. It is a flavor enhancer and a preserver. In ancient times it was often as precious as gold and was even used on occasion to pay Roman legions their wages. In Leviticus 2:13, salt is a requirement for every grain offering. In 2 Kings 2, the prophet Elisha used salt to bring healing to a polluted spring. Needless to say, salt is essential to human existence. Yeshua says that we are the salt of the earth. What does this mean? It means that his disciples are the ones who should be making those around us better and thus preserving the world. As disciples of Yeshua, our “salt”—kindness and hospitality—should be continually rubbing off onto others. It should be a natural component of who we are as his disciples. But why aren’t some disciples of Yeshua this way? Can salt lose its saltiness? If so, how does this happen? Sometimes salt isn’t salty, because it’s really not salt at all. For instance, magnesium sulfate (commonly known as Epsom salt) looks very similar to table salt. However, its chemical structure is not the same as the salt in discussion. It doesn’t have the same properties as sodium chloride. Just because it looks like salt from the outside, doesn’t mean it is. 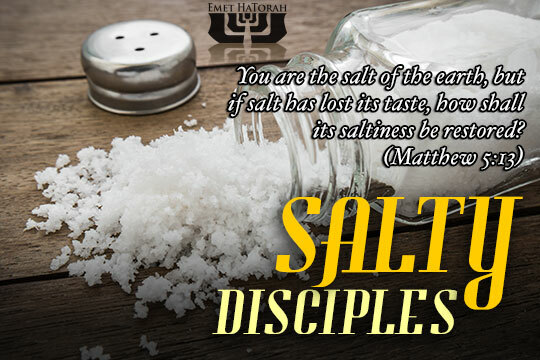 Yeshua says that a disciple who isn’t “salty” isn’t a true disciple. The author of Hebrews alludes back to the story of Lot’s wife when he says, “Do not neglect to show hospitality to strangers, for thereby some have entertained angels unawares” (Hebrews 13:2). Although Lot’s wife had the opportunity to provide hospitality for angels, her inhospitable nature would not allow something as precious as salt to be “wasted” on strangers. Thus, when the angels delivered them from the region before its destruction, Lot’s wife was turned into the very thing that was too precious to share with her divine guests. As disciples of Yeshua, we should be working to bring tikkun (repair) to the world for the damages incurred through the sins of Lot’s wife and all who walk in her spirit. Our lives should be affecting those around us. Yeshua was accessible and made a difference in the lives of those around him. We should be pouring into the lives of others as well. If we are not, then we should be examining our status as a disciple. Let us not repeat the sins of Lot’s wife through refusing to be hospitable and sharing what we have been given. May our salt be poured out for others. This includes everything from the food from our tables to the Torah in our hearts. He who has ears to hear, let him hear.